While the festivities have ended, the campaign continues. We have 60 hours left to go on our IndieGogo fundraising campaign. If you have pledged already, thank you so much. If you have a minute, please share our campaign with your friends and family. If you haven’t yet pledged, we appreciate any contribution you can make. Every little bit counts to help us renovate our new space and expand our capoeira leadership programs for young people in NYC (learn more). New York, NY: Brazil’s National Soccer Team did not live up to expectations during their quarterfinal World Cup match. In the first half hour, the team was down by 5 points against Germany. This huge upset is heartbreaking for fans who see their team with national pride. Thankfully, Brazilians in New York City have an opportunity to support Capoeira, another Brazilian sport, help spread their culture and show their national pride. Afro Brazil Arts, a non-profit youth organization that uses capoeira to teach children and young adults throughout New York City leadership skills, Brazilian culture and mindful physical fitness, will have their annual summer party on Wednesday July 9 at Leftfield’s, 87 Ludlow Street from 7:00pm – 9:30pm. The party will feature live drummers, a raffle for free capoeira and music lessons, and happy hour priced drinks. There is a $10 suggested donation at the door. Capoeria, a martial art that combines dance, acrobatics and music, is Brazil’s true national sport. It was developed in Brazil by African descendants in the 1700s and incorporates many native Brazilian influences. Afro Brazil Arts has brought capoeira to public schools and community centers for the last 25 years as a means to inspire achievement and promote community in the Lower East Side and the East Village. Proceeds from the Summer Party will benefit the Afro Brazil Arts’ new studio and Young Scholars program. Is the World Cup making you crave some more Brazilian culture? Come to Leftfield in the Lower East Side for the Afro Brazil Arts Annual Summer Party on Wednesday, July 9. Come early for a free capoeira lesson and demonstration starting at 7 pm, live music and a raffle for lessons and other prizes. Happy hour drink specials will be available from 7 pm until 9:30 pm. 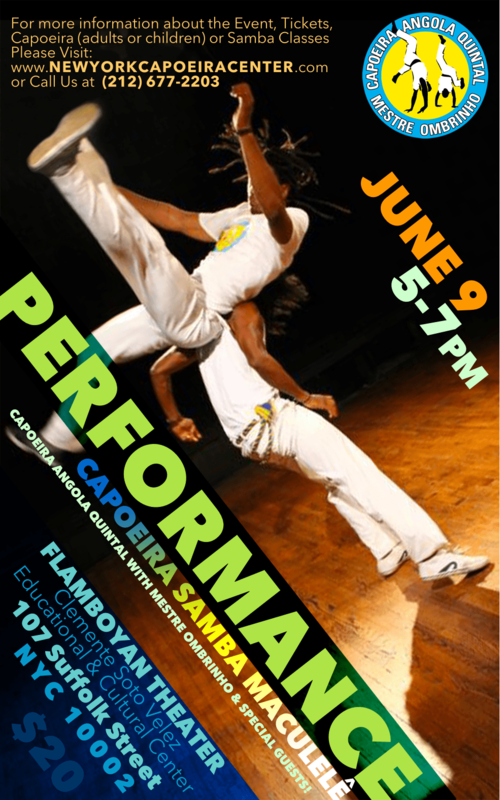 Proceeds will benefit the Afro Brazil Arts’ New York Capoeira Center Renovation Project and our Young Scholars program. Tickets: $10 admission or $20 admission + 4 raffle tickets. Purchase tickets online. * The raffle will include capoeira gear, private lessons, and a custom beriambau cabaça by Solomon Ariranha Nadaf. Can’t attend the event? Please donate to our IndieGogo capital campaign for our new space. I was out for a late-night snack with some friends in the East Village. While walking down Ave A, I felt myself blindsided and body-checked by someone walking the opposite direction, knocking me a bit off my balance. Instinctively, my foot instinctively just happened place itself just behind my assailant’s achilles tendon. Rasteira. I look up and make eye-contact with my would-be assailant. It turns out to be a young woman more on the silly side of sloppy. Her eyes say, “not a threat, no disrespect.” The placed (but not pulled) rasteira says, “appropriately non-violent defense to perceived hostility.” Or in other words, “I’ve got options if there were actually belligerent intent.” Disengage rasteira. All of this happened in a matter of seconds. Situation diffused, we go our separate ways.